I can’t even begin to tell you how much I love the way this project turned out. It may be my favorite element in Reese’s nursery. (But then I turn around and start thinking something else in the room is my favorite.) Hanging above the dresser are my Birdhouses and three of the Little Birdies hanging from clear thread. I found this dresser at the ReStore about a year ago for $5, as is. 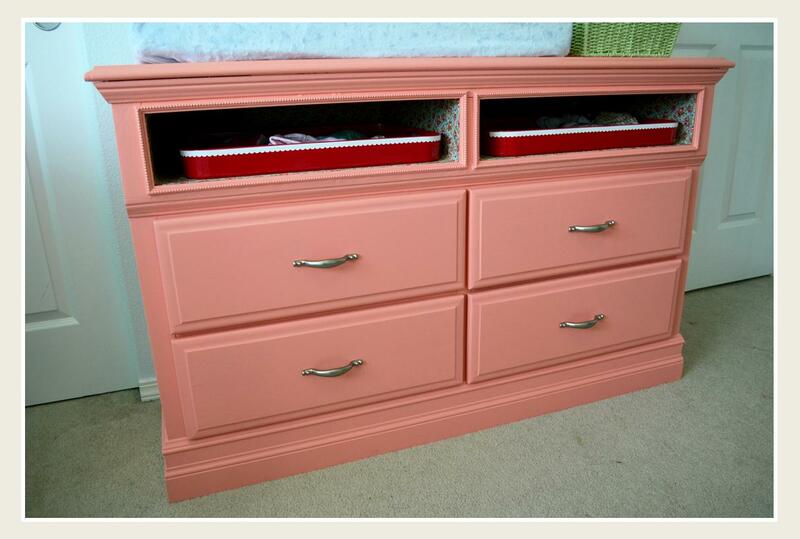 The top drawers were broken and the bottom trim was pulled off, but all the pieces were there. 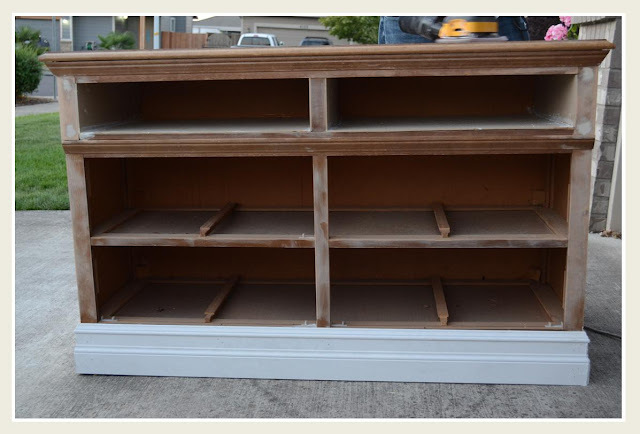 I just couldn’t resist such a deal, figuring we could turn it into an entertainment center (like THIS ONE by Sausha from Sweet Pickins Furniture) and sell it. Well, it sat in our garage for about a year, and then I got pregnant. 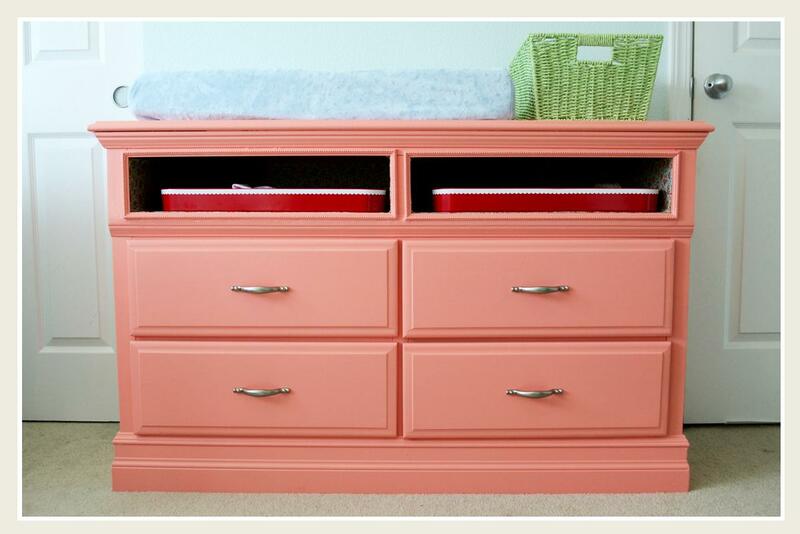 Suddenly it was perfect as the dresser/changing table for Reese’s nursery. 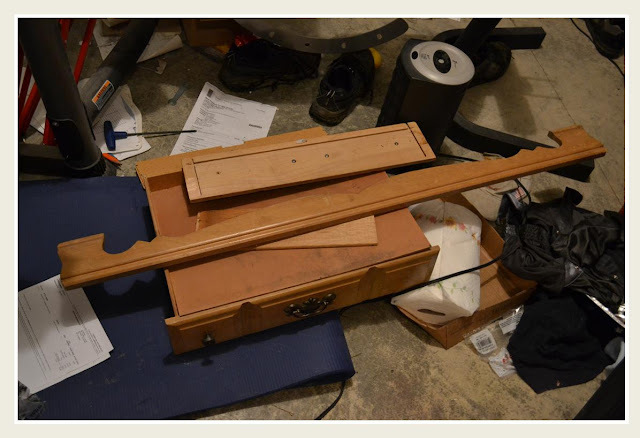 Despite all the pieces being there (or so I thought), it was in pretty bad shape. One of the top drawers was broken beyond repair, and one or two of the bottom drawers had broken tracks on them. 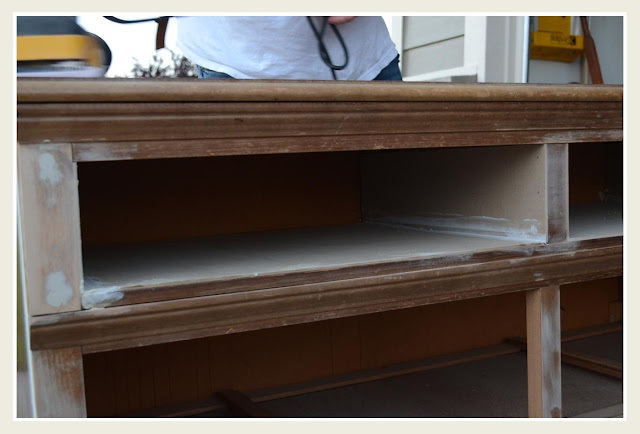 Nolan got to work repairing the bottom drawers by ripping the still in tact tracks off the top drawers and reinforcing all the sides of the drawers with Gorilla Glue. I wanted to use baseboard trim around the base for a chunky look instead of putting the original and dated trim back on. We picked up some 5” baseboard trim (exactly the size of the gap at the bottom that needed to be covered) and some decorative trim to go around the top cubbies. We glued and nailed the baseboard around the base (and filled in any gaps with wood filler). Then Nolan used very thin (I think 1/8”) board to box out three sides each of the two top drawers. He found it to be a difficult process because while he was making straight cuts, the openings weren’t square. So we used a lot more wood filler. We also filled in some holes where I’m guessing there were some decorative elements originally. 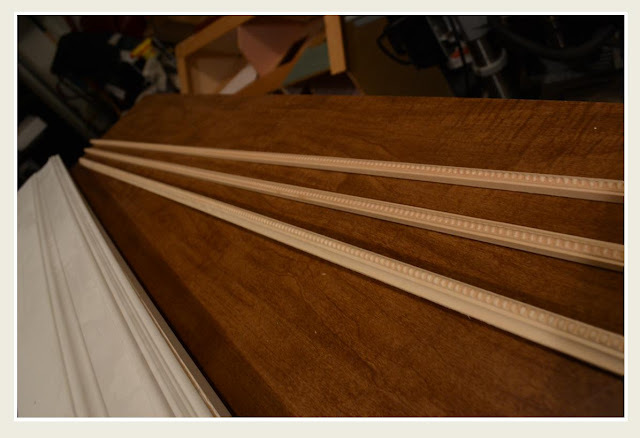 He then glued the beaded decorative trim around the openings. After a light sanding, my mom gave the whole thing a light coating with Kilz Spray Primer, followed by two coats of Sherwin Williams Pro Classic paint in Charisma. The lady at Sherwin Williams was very helpful and suggested this paint because it drys like normal paint, and then after about two weeks it cures into a very hard, almost laminate strength finish. You don’t need to use any sort of poly or top coat and the semi gloss is easy to clean up. She also recommended using a high quality brush to paint with. My mom started out using a roller, figuring it would be just as easy to start with. But this paint works a little differently and doesn’t move like normal paint. She switched to a Purdy brush and was much happier with how easy it was to paint with. The finish is beautiful! Just know that it’s a heavier paint, so you need to be careful not to overwork the paint as it starts to dry, and we did have a few drips because of some thicker spots moving as it dried. And no, Sherwin Williams did not compensate me for this. I just like the paint that much. I love the way the trim turned out! It looks like it’s always been there. Nolan is very proud of how well the corners turned out, especially after having to use so much wood filler. The pulls are Martha Stewart from Home Depot. I knew finding shallow enough baskets for the top cubbies would be pretty difficult, so I looked for kitchen trays instead. I originally hoped to find wooden ones at a craft store and then paint them the same green as the frame above the dresser, but I couldn’t find any large/deep enough. I finally found these plastic ones at Target and they were perfect. 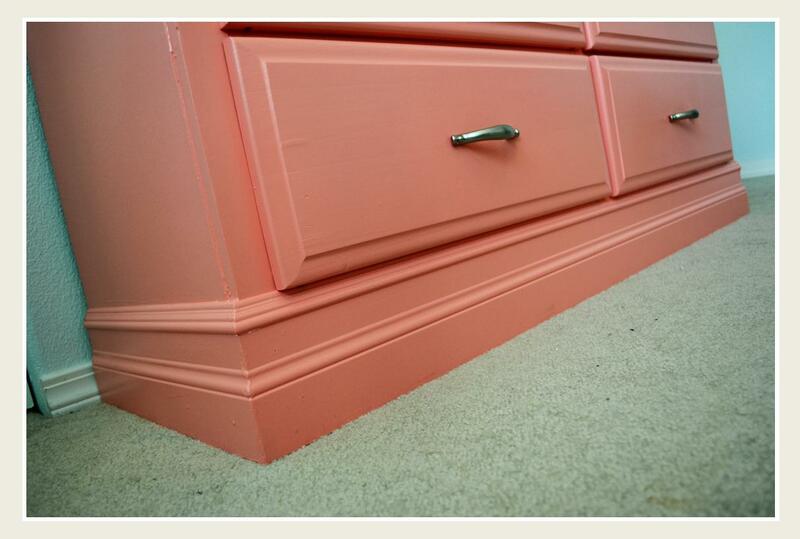 Some white scalloped vinyl trim softened them up enough so the pink/red wouldn’t look too valentine-ey together. 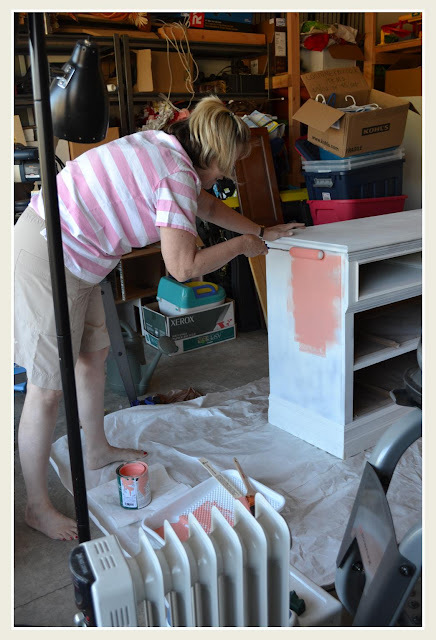 Painting the inside of the cubbies was going to be hard, as well as getting the wood filler sanded smoothly enough so it wasn’t ugly, so my mom and I thought it would be best to line the cubbies. 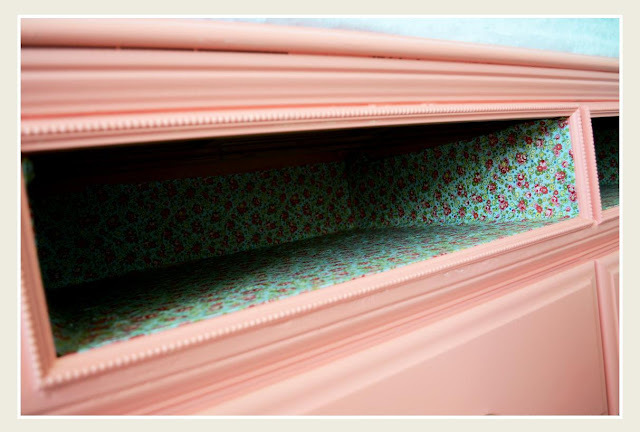 I couldn’t find any shelf liner that I liked enough, so instead I bought this vintage-style fabric at Walmart and Mod Podged it on. I think it’s so sweet! 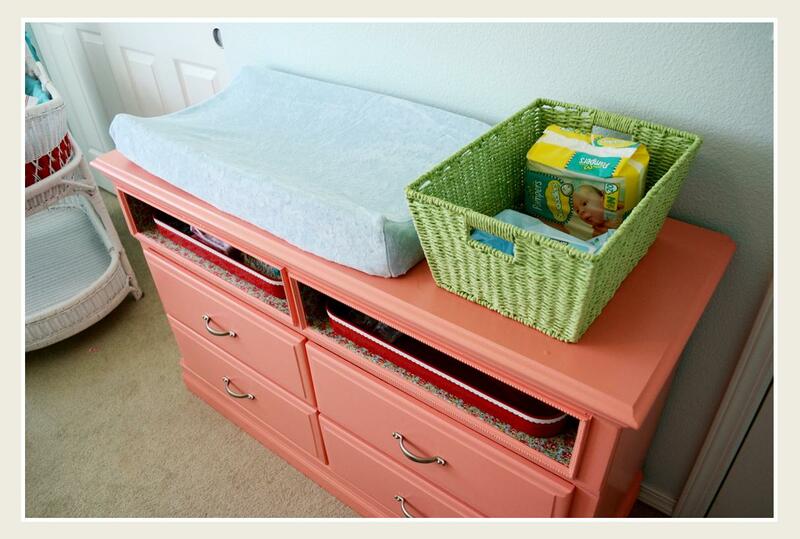 The dresser perfectly holds the changing pad and a basket for diapering supplies. The changing pad cover was bought for Jace’s nursery, and I love that it works in Reese’s too! And one last look at its loveliness. I was thinking this would be my last detailed project post before doing the final nursery reveal, but then I realized I have two more projects to share with you. I want the reveal post to be simple without all the project descriptions (just links to them), so I’ll be sharing it with you soon! I was thinking that this dresser was also my favorite. And then I saw the adorable fabric lined cubbies and I knew that this is my favorite! Oh my, I LOVE it! Great job on all of it. You are one talented woman, Jill. Can't wait to see Reese! 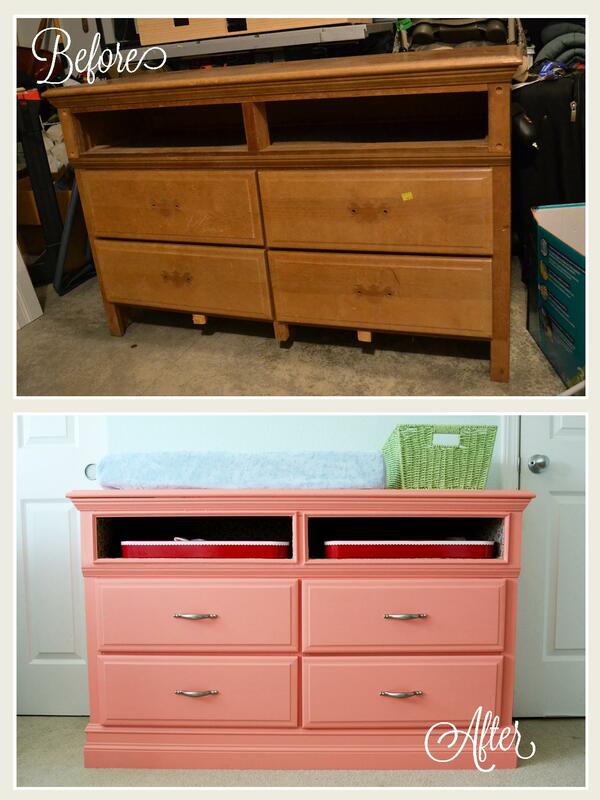 Wow, you really transformed this dresser! It looks lovely. Those birdhouses are even cuter with the frame around them! It turned out beautifully! That's a dresser I never would've bothered with - but I"m really impressed at how you guys handled it. Nice work. Wow! So impressive! It's beautiful. This looks amazing! I think I'm going to have to tag along with you the next time you go to Restore...or I have to check it out myself! :) You have given me the itch to get crafty, so thanks! The dresser is absolutely lovely. I love the cubbies! What great ideas you have. I'm sure the dresser is happy to have a new fresh coat of paint and have a good home. The baby's room is turning out so sweet! Looks like you are having so much fun. Fabulous! 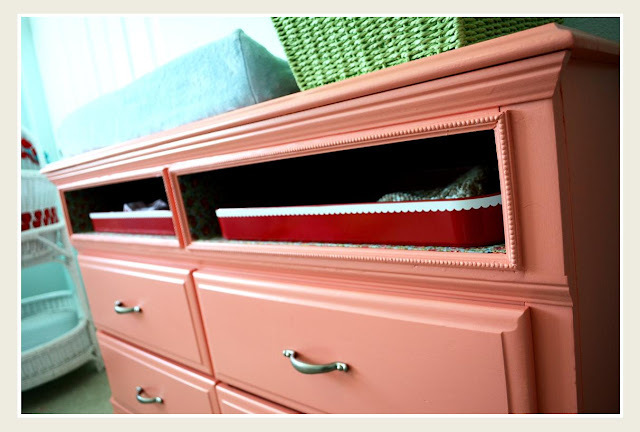 Love the color and the bead trim. 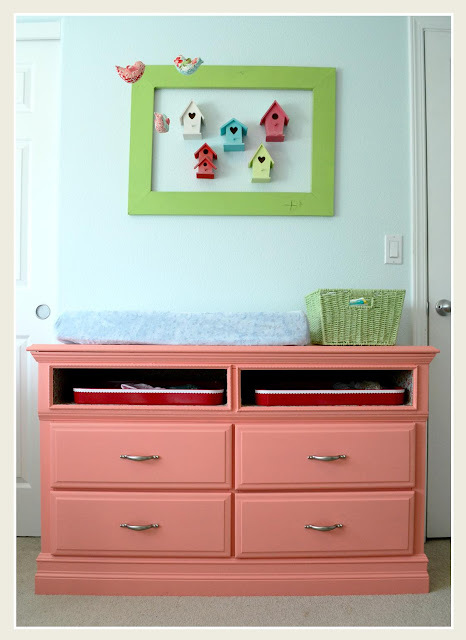 The little birdhouse accent piece is so super cute too. I'm so excited to see this room come together...you really are very inspiring. Absolutely adorable! Reese's room is so awesome!!! This is so cute! Anything coral is a beautiful thing. I also loved that you covered the inside of the top shelves. So pretty! oh love the colour and you did an amazing job!! Beautiful job. I have a link party on Wednesdays, and I would love it if you would link this and any other posts. It is called Wednesdays Adorned From Above Link Party. It runs from Wednesday to Sundays. I'm so glad that I'm following you! Wow, what a difference. And I love the beaded trim. You did an incredible job! Thanks for posting on tt&j link party! This really turned out pretty! I love the floral fabric you used. Such a sweet surprise when you look inside. I hope you'll share this at Gettin' Krafty With It this week! This is adorable! Stopping by from get your craft on!